I am a fan of receiving albums that don’t necessarily slide into the umbrella of genres I listen to and this is ultimately one of them. Opening up with exceptional piano work really gets me in my stride, especially when it’s performed to perfection, as this is. Comparisons to Ludovico Einaudi are always going to be made when listening to albums of this nature. These guys are cut from the same cloth so to speak and whilst piano is the main tool across all of the nine tracks on this album, there are momentary bursts of cello and violin to fill out and expand on the engaging atmosphere created from the mind of Bavota. It’s also a difficult beast for me to review this release. I have never actually sat down to review a straight pianists album in full and coming from an electronic music listeners perspective where people dabble with such a medium on the odd occasion, it’s like a breath of fresh air to be exposed to an album of this ilk in one sitting. Bavota captivates from the start to the very finish and little air is given track by track; but just enough to pull on the heart strings in every direction. 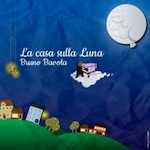 ‘La Casa Sulla Luna’ is one of those releases that require attention and a space in time to sit back on a summer afternoon, solitary, with a glass of wine and a light breeze pushing against the leaves on the trees. It’s an album that will make you think back on life with a smile on your face, even when reflecting on those moments of adversity.